After Ukrainian President Petro Poroshenko voiced support for the ‘KyivPride2015’ equality march stating that he didn’t see “any reason to impede this march because it’s a constitutional right of every citizen of Ukraine.” Today dozens of members of Ukraine’s neo-Nazi Right Sector Party viciously attacked the event leading to at least 25 arrests. The BBC reports that five riot police were injured, one seriously. 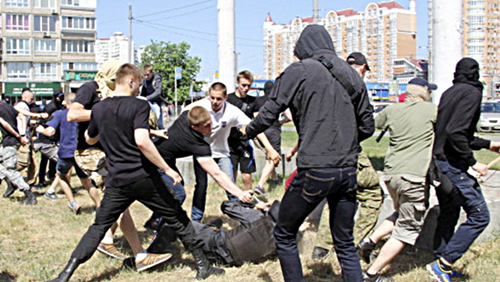 Several dozen unknown assailants attacked a gay pride rally in Kiev on Saturday, throwing flares and wounding two policemen, a Reuters witness reported. Organizers for ‘KyivPride2015’ said the march along the Dnipro river would go ahead despite warnings from city mayor Vitaly Klitschko, who advised the event be canceled because of a threat of violence from far-right groups. Despite the presence of several hundred police in riot gear, the march of around 150 LGBT supporters carrying rainbow banners and placards came under attack and 25-30 “hooligans” were arrested, parliament member Serhiy Leshchenko said on Twitter. Leshchenko said police had prevented any direct clashes between participants in the march and the attackers. None of the march’s participants were harmed.